Poor response to ovarian stimulation in IVF is a major challenge in IVF cycles and infertility treatment methods. No effective approach has been found yet to treat poor response to ovarian stimulation. However, there are several reports on possible methods affecting the performance of gonadotropins in the ovaries such as the use of high-dose gonadotropins,, treatment with growth hormone,, glucocorticoids,,, and low-dose aspirin. Another treatment is the use of low-dose androgens to improve ovarian response to gonadotropins. The basis of this theory in literature is this fact that an increase in intrafollicular androgen increases the number of follicle-stimulating hormone (FSH) receptors on granulosa cells. As a result, the growth of follicles is improved leading to a better response to the gonadotropins. During folliculogenesis, low-dose androgen plays an important role as a substrate in the production of estradiol in the granulosa cells. They also play a trophic role in the growth of follicles, especially during the early growing stage of follicles when the dominant follicles are not yet selected. Studies on Macaca mulatta in the past decade show that administration of low doses of androgens stimulates the growth of follicles. According to Vendola et al., granulosa cells experienced a dramatic growth after administration of testosterone or dihydrotestosterone. Testosterone gel has been used as priming before the IVF cycle majority with the microdose flare protocol in previous studies. In the current study, the effect of testosterone gel during ovulation on the fertility rate in women with a poor ovarian response to IVF cycle was examined using antagonist protocol, and the results were compared with the lubricant gel as a control intervention. This is a single-blinded, randomized clinical trial. 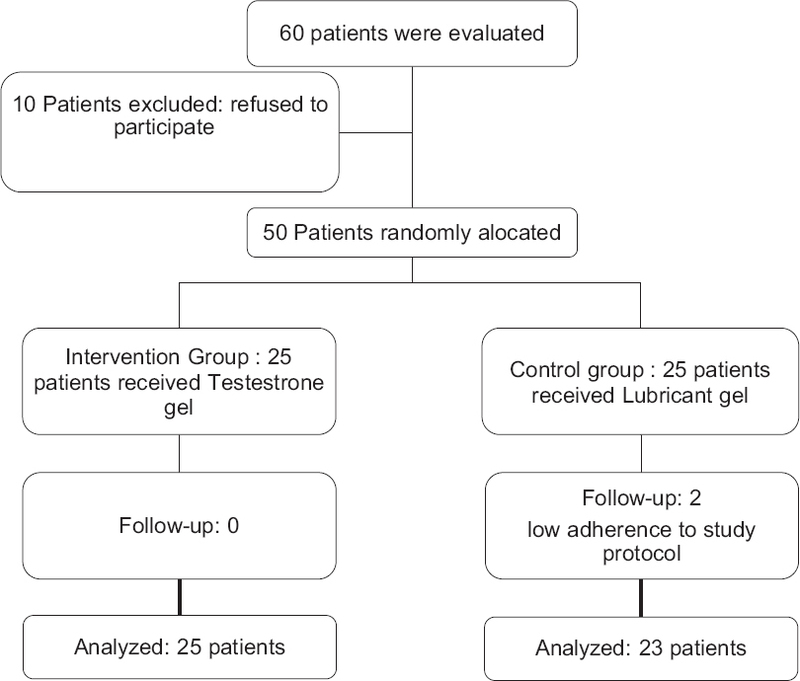 Patients met the inclusion criteria were randomly divided into two groups each included 25 participants treated with a placebo (lubricant gel, the control group) and testosterone gel (intervention group). Inclusion criteria were as follows: candidates for IVF cycles, patients older than 40 years, a cycle with early poor response, i.e., to obtain 3 or <3 oocytes of the cycles by normal stimulating, an antral follicle count (AFC) <5–7, anti-Mullerian hormone (AMH) <0.5–1.1 ng/ml, and male factor normal-FSH <15, and individual's consent to participate in the research project. Exclusion criteria in the current study were as the presence of endocrine disorders (thyroid, prolactin, etc. ), endometrioma, and any history of surgery on the ovaries, reluctance to participate in the project, new clinical conditions or a change in a treatment procedure, sensitivity to testosterone gel and its complications. The conditions and possible side effects of testosterone gel were explained, and informed consent was obtained from the patients. The study protocol was registered in Iran center for clinical trials with clinical study registration number: IR.SBMU.RETECH.REC.1395.1007. Furthermore, the study protocol was approved by Ethic Committee of Shahid Beheshti University of Medical Sciences. The definition used in this study for poor responders to gonadotropins in IVF cycles is the Bologna criteria introduced by European Society of Human Reproduction and Embryology in 2011. A questionnaire was designed for data collection. The questionnaire consisted of three sections including age and patients history including the number of previous IVF, AFC, FSH, AMH, and duration of infertility (year); also the results after the intervention including oocyte, embryo, Grade A. B and grade C. D and the pregnancy was recorded in the designed questionnaire. The patients were randomly divided into two groups and were single blindly treated with placebo (lubricant gel, control group) and testosterone gel (intervention). Thus, the testosterone and placebo gel (lubricant) were purchased with the same shape, size, and color with similar package and labels. The patients and analyzer were not aware of the actual content of the gel until the end of analysis. Each batch contains 25 mg testosterone or placebo gel (lubricant). First, estradiol, FSH, luteinizing hormone (LH), total testosterone, prolactin, and high thyroid hormones were measured by radioimmunoassay in the 3rd day of menstruation in a reputable laboratory. To ensure the normality, the patients received mercksern FSH gonadotropins (gonal-f) at a dose of 300 units from the 2nd day of the menstrual cycle. At the same time, the patients in the experimental group received 25 mg BayerShering Pharma testosterone gel daily for external use on the arm. The patients in the control group received lubricant gel and FSH. The patients were examined by ultrasonography every 48 h. When the follicle diameter reached 13–14 mm, antagonist (cetrotide) was administered to the patients, and the use of gels continued until human chorionic gonadotropin (HCG) administration. When at least three follicles reached a size of >18 mm, the patients received 1000 IU HCG hormone intramuscularly in the form of 5000 IU ampules (Organon, Holand). Oocytes were transferred 36–38 h after injection of HCG under general anesthesia guided by transvaginal ultrasonography. Fertilized embryos were transferred into the uterus 48–72 h after the transfer of oocytes. If the endometrial thickness was <7 mm, the embryos were frozen and not transferred in that IVF cycle. The number of oocytes obtained, the number of embryos, the number of transferred embryos, the number of FSH ampules consumed, and the pregnancy rate were compared in the two groups. Normality of continuous data was explored using Q-Q plot and Kolmogorov–Smirnov test and nonnormal positive skewed data were subjected to logarithmic transformation, and these data were expressed as mean ± standard deviation (SD) as well as median (minimum–maximum). Categorical data were expressed as frequency (percentage). Independent t-test and Chi-square (or Fisher's exact test) was used for comparing data between study groups. Odds ratio (OR) and 95% confidence interval (95% CI) were calculated to evaluate the impact of intervention on categorical fertility outcomes (i.e., pregnancy and embryo of quality A-B and C-D). All statistical analyses were conducted using SPSS software version 20 (IBM, Inc., Chicago, IL, USA). Twenty-three patients in the control group and 25 patients in the experimental group were completed the study protocol. Two patients in control group did not adhere to the study protocol then they were excluded from the study [Figure 1]. 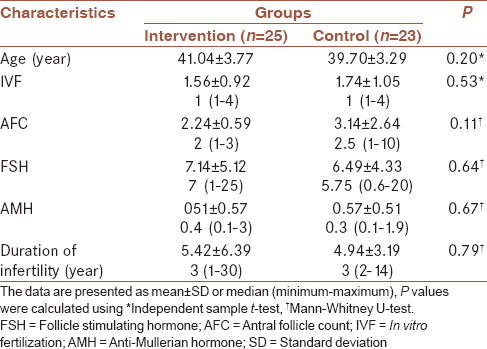 [Table 1] presents the mean age and mean ± SD (median [minimum-maximum]) of basic clinical preintervention fertility-related variables of study participants in both intervention and control groups. As can be seen, no statistically significant differences were found between groups; indicating the comparable conditions in both groups before starting the study. 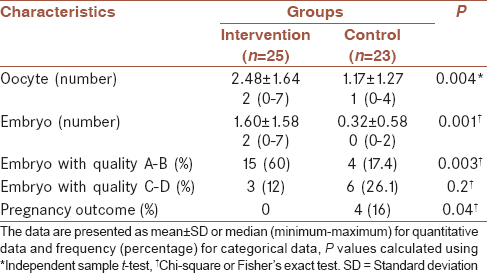 [Table 2] presents the results of interventions on main outcomes of the study. The mean number of oocytes and embryo significantly higher in testosterone gel group than lubricant gel control group (both P < 0.01). The frequency of embryo with quality of A-B significantly higher in intervention group than control group, in which the testosterone gel increases the odds of embryo of quality A-B about 2 times (OR = 2.06, 95% CI: 1.23–3.46) while no significant difference was found between two groups in terms of embryo with quality C-D. The frequency of experienced pregnancies (16%) statistically significantly higher in intervention group than control group (0); the testosterone gel increases the odds of pregnancy 20% (OR = 1.20; 95% CI: 1.01–1.43; P < 0.05). Our results showed that mean number of embryos in patients used testosterone gel was significantly more than that in the control group. In this regard, the results of a study by Haydardedeoglu and Isik on 25 patients showed that administration of 75 mg/day dehydroepiandrosterone for a 3-month period before the start of the IVF cycle lead to a significant increase in oocyte and embryo quality. The rate of pregnancy in our patients that used testosterone gel was significantly higher than control group. Hence, it can be concluded that the use of testosterone gel was effective treatment approach for infertility. Kyrou et al. found that a slight increase in serum androgen enhanced the success of IVF cycles with a poor response to gonadotropins, leading a decrease in FSH dose needed to affect the ovary. According to Fábregues et al., the use of 12.5 mg (the half of the dose in our study) transdermal testosterone for 2–4 weeks before the start of the IVF cycle decreased unsuccessful IVF cycles. Sipe et al. reviewed the impact of transdermal testosterone gel in patients with low ovarian reserve. According to this study, the required dose of FSH to stimulate the ovaries in patients used transdermal testosterone was much lower. González-Comadran et al. conducted a meta-analysis to investigate the impact of transdermal testosterone in pretreatment month in patients with poor response to gonadotropin. Their results showed an increase in the number of live births with less gonadotropin intake. In another study by Mitri et al. in Toronto, Canada, transdermal testosterone gel with microdose flare protocol was used for 26 women 34–47 years for 7 days. The use of this gel improved oocyte quality and follicle growth and estradiol while lowering FSH dose compared to the control group. All above-mentioned studies except Mitri et al. 's study  had used androgen as priming before starting the IVF cycle. In a pilot study by Mitri et al., androgen was used with the microdose flare protocol at the start of IVF cycle. Seven days after the start of the cycle, gonadotropin discontinued, and the use of testosterone continued to HCG injections. The current study is the only one with antagonist cycle, in which testosterone gel and gonadotropin were used from the beginning of cycle and continued until HCG injection. In fact, androgen alternatively plays the ultimate role of LH to enhance the follicular response to FSH. This in turn improves the quality of oocytes and the number and quality of embryos and consequently the fertility rate. One limitation of our study is the low number of participants. Thus, a study on larger populations with more participants is recommended to be conducted. In addition, ultrasonography was performed for follow-up of participants until the diagnosis of clinical pregnancy; however, more long-term follow-up is needed. According to the results of our study, the testosterone gel has a positive impact on fertility rate in women with poor response to IVF cycles. The use of testosterone gel improved the quality and number of oocytes as well as the number and quality of embryos and consequently the fertility rate. Further studies on larger sample with longer intervention period are recommended to evaluate the impact of testosterone gel on fertility and pregnancy. Keay SD, Liversedge NH, Mathur RS, Jenkins JM. Assisted conception following poor ovarian response to gonadotrophin stimulation. Br J Obstet Gynaecol 1997;104:521-7. Mahutte NG, Arici A. Poor responders: Does the protocol make a difference? Curr Opin Obstet Gynecol 2002;14:275-81. Keay SD, Liversedge NH, Jenkins JM. Could ovarian infection impair ovarian response to gonadotrophin stimulation? Br J Obstet Gynaecol 1998;105:252-3. Hull MG. Infertility treatment: Relative effectiveness of conventional and assisted conception methods. Hum Reprod 1992;7:785-96. Ombelet W, Puttemans P, Bosmans E. Intrauterine insemination: A first-step procedure in the algorithm of male subfertility treatment. Hum Reprod 1995;10 Suppl 1:90-102. Seibel MM. Infertility: A Comprehensive Text. 2nd ed. Philadelphia: Appleton & Lange; 1997. p. 667-751, 807-22.
van Hooff MH, Alberda AT, Huisman GJ, Zeilmaker GH, Leerentveld RA. Doubling the human menopausal gonadotrophin dose in the course of an in-vitro fertilization treatment cycle in low responders: A randomized study. Hum Reprod 1993;8:369-73. Karande V, Jones G, Veeck L, Muasher S. High dose follicule stimulating hormone stimulation at the onset of menstrual cycle does not improve the in vitro fertilization outcome in low responder patients. Fertil Steril 1990;53:486-9. Adashi EY, Rohan RM. Intraovarian regulation: Peptidergic signaling systems. Trends Endocrinol Metab 1992;3:243-8. Tarlatzis BC, Zepiridis L, Grimbizis G, Bontis J. Clinical management of low ovarian response to stimulation for IVF: A systematic review. Hum Reprod Update 2003;9:61-76. Miell JP, Taylor AM, Jones J, Holly JM, Gaillard RC, Pralong FP, et al. The effects of dexamethasone treatment on immunoreactive and bioactive insulin-like growth factors (IGFs) and IGF-binding proteins in normal male volunteers. J Endocrinol 1993;136:525-33. Smith MP, Mathur RS, Keay SD, Hall L, Hull MG, Jenkins JM. Preovulatory human oocytes, cumulus cells and ovarian leukocytes express type 1 but not type 2 11- beta- hydroxysteroid dehydrogenase (11 ß-HSD) RNA. Fertil Steril 2000;73:825-30. Lok IH, Yip SK, Cheung LP, Yin Leung PH, Haines CJ. Adjuvant low-dose aspirin therapy in poor responders undergoing in vitro fertilization: A prospective, randomized, double-blind, placebo-controlled trial. Fertil Steril 2004;81:556-61. Bosdou JK, Venetis CA, Kolibianakis EM, Toulis KA, Goulis DG, Zepiridis L, et al. The use of androgens or androgen-modulating agents in poor responders undergoing in vitro fertilization: A systematic review and meta-analysis. Hum Reprod Update 2012;18:127-45. Weil S, Vendola K, Zhou J, Bondy CA. Androgen and follicle-stimulating hormone interactions in primate ovarian follicle development. J Clin Endocrinol Metab 1999;84:2951-6. Vendola KA, Zhou J, Adesanya OO, Weil SJ, Bondy CA. Androgens stimulate early stages of follicular growth in the primate ovary. J Clin Invest 1998;101:2622-9. Sipe CS, Thomas MR, Stegmann BJ, Van Voorhis BJ. Effects of exogenous testosterone supplementation in gonadotrophin stimulated cycles. Hum Reprod 2010;25:690-6. Haydardedeoglu AZ, Isik EB. The combination of dhea, transdermal testosteroneand growth hormone as an adjuvant therapy in assisted reproductive technology in patients with dor below 40 years of age. Fertil Steril 2014;102:221-2. Kyrou D, Kolibianakis EM, Venetis CA, Papanikolaou EG, Bontis J, Tarlatzis BC. How to improve the probability of pregnancy in poor responders undergoing in vitro fertilization: A systematic review and metaanalysis. Fertil Steril 2009;91:749-66. Fábregues F, Peñarrubia J, Creus M, Manau D, Casals G, Carmona F, et al. Transdermal testosterone may improve ovarian response to gonadotrophins in low-responder IVF patients: A randomized, clinical trial. Hum Reprod 2009;24:349-59. González-Comadran M, Durán M, Solà I, Fábregues F, Carreras R, Checa MA, et al. Effects of transdermal testosterone in poor responders undergoing IVF: Systematic review and meta-analysis. Reprod Biomed Online 2012;25:450-9. Mitri F, Behan LA, Murphy CA, Hershko-Klement A, Casper RF, Bentov Y, et al. Microdose flare protocol with interrupted follicle stimulating hormone and added androgen for poor responders – An observational pilot study. Fertil Steril 2016;105:100-50.